"You can see now how it is written that the Messiah suffers, rises from the dead on the third day, and then a total life-change through the forgiveness of sins is proclaimed in his name to all nations—starting from here, from Jerusalem!" 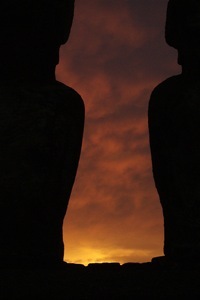 Photo of Easter Island, Chile by Rodrigo Garcia. Licensed under Creative Commons.